Welcome to the inaugural issue of A Legal Miscellanea! In its pages you will find articles about the Law Library’s collections and services, highlights of new acquisitions, notification of library events and exhibits, as well as exploration of issues of interest to researchers and bibliophiles. 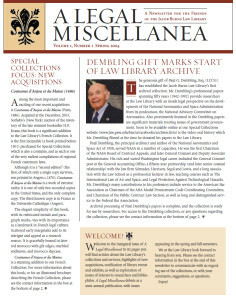 Click here to see the full Spring 2004 issue of A Legal Miscellanea.